It has been about a month since I’ve posted and I have to apologize for leaving my audience hanging. The first week or so after finding out I was pregnant was great considering I didn’t have any symptoms except being a little more tired than usual and irritable once in a while. Then, the nausea hit me and I was sleeping most of the day. In addition to feeling crappy and doing almost nothing but eating, (or more accurately attempting to eat) sleeping and lying in bed watching TV, I found myself dealing with guilt over being completely unproductive. It’s hard for me to sit and do nothing. I even have a hard time being sick for a day or two, but suddenly found myself completely dependent on Dave for weeks. There was nothing I wanted to eat and when I found something passable I would feel as though I were forcing it down and I’d end up getting nauseous soon after eating. Finally, we had an appointment at about 8 weeks and I discussed my frustration with Dr. Shin. She assured me it was ok to lose weight in the 1st trimester and suggested homeopathic remedies, such as ginger, that I had already been trying. I told her I had tried ginger chews, ginger snaps, gingerale, mint lifesavers, and was already eating small frequent meals (although not really frequent considering I hated eating). Then she offered to prescribe me some drugs for the nausea. Again, I had to get over my irrational guilt. Although they can’t be certain the drugs won’t hurt the baby she reminded me that thousands of pregnant women have taken them and they haven’t yet noticed any problems. But I also had to remind myself that it does not make me a weak person because I choose to take a medication to improve my daily life. Although I’d describe the nausea as mild, it has really been wearing on me not to have a moment’s rest from it and on my list of least favorites sensations nausea is definitely near the top, if not #1. So now I’m taking Metoclopromide, a generic form of Reglan, and here I am finally writing again. I’d say it’s worth it, as long as the baby comes out happy and healthy. The trick will be not blaming myself if there are complications. 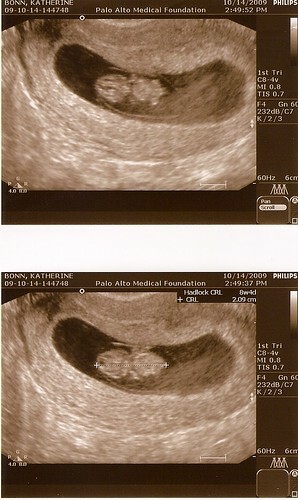 Based on the ultrasound we got at our last appointment s/he looked happy and healthy! Swimming around and sprouting little leg and armbuds. Now I can’t wait for the next one. I want to see more baby wiggling! Next > Me Want Foooood! Congratulations, Katie. I’m glad to hear things are getting better. I’m not even sure what the heck I would do going through all those changes while trying to maintain a normal life. Good luck with everything. I’m so glad you’re getting some relief from the nausea. And thanks for posting the ultrasound pictures . . . already s/he’s a cute little peanut. Ufda, that nausea sounds so horrible. I’m glad you’ve finally gotten some relief. Babies are pretty sturdy little beasts, underneath all the thousands of needs they have. So I’m glad you decided to take care of yourself now so you’ll be all set to take care of him/her when s/he needs it most.